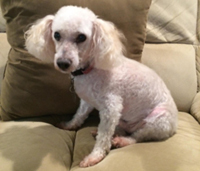 ADOPTION PENDING: Extremely sweet cream poodle Como is Mr. Personality. He was surrendered because his owners wanted to travel and didn`t want the responsibility of a dog any longer. Como loves to snuggle and will make you the center of his world. He has so much love to give you and will become your shadow and follow you everywhere. Como is allowed on the furniture and loves to sleep with his human.